Here’s a basic primer on how the divorce process works. No two divorces are exactly alike. Every marital breakup has its own unique legal, financial, and/or parenting issues, which require their own resolution strategies. However, every divorce undergoes the same general journey from initiation to closure. Whether you and your spouse make this journey slowly or quickly, expensively or inexpensively, stressfully or peacefully is up to you, but the destination is always the same: from shared to separate lives. Here’s a basic primer of how the divorce process works in the United States and Canada. Bear in mind that you need to speak to a family lawyer to discover how the options vary in your state or province, as well as how the details and circumstances of your situation may affect your process. Although it may feel like it sometimes, life does not come to a halt while you’re negotiating your divorce. Whether your divorce case takes six months or six years from beginning to end, you have to keep food on the table and a roof over your heads, among other things. During this temporary period before a divorce is finalized, most people are able to reach an agreement about how to pay for their expenses. If they can’t reach agreement, they might have to go to court to ask a judge to issue temporary orders. A temporary order/agreement establishes quick decisions about the children, property, bank accounts, support, and other key issues during the separation period. For example, if one spouse moves out of the home and the other has no income, how will the latter feed the kids and pay the bills? One of the most common temporary orders is for spousal support. To obtain this order, you must establish that one spouse needs the support and that the other spouse is able to pay it – which may require a Financial Affidavit or Statement detailing both spouses’ living expenses and incomes. You should hire a divorce lawyer and/or mediator and financial advisor as soon as possible. You’ll set your temporary order/agreement in a brief, relatively informal hearing before a judge, so prepare a complete list of what you want to request. The items you can request include: temporary custody and visitation arrangements; a restraining order (if there has been domestic violence); child or spousal support; and/or who gets the car and house. Next, you or your spouse will file a petition, application, or complaint for divorce with your local family court. The person who files (“the plaintiff”) serves a summons upon the other spouse, stating that they want a divorce and what they are seeking in terms of property, child custody, spousal and child support, etc. The other spouse (“the defendant”) must answer the summons and, if they wish, can make their own claim. Full names, addresses, phone numbers, and Social Security or Social Insurance numbers for you, your spouse, and your children (if applicable). The date of marriage, date of cohabitation, county or region where the wedding occurred, the wife’s maiden name, and any information about prior marriages of either spouse (including the names and prior names of ex-spouses). A copy of your premarital agreement (or other domestic contract) and information about any prior legal proceedings, separations, or marital counseling during the marriage. All available financial data, including: income-tax returns from the last five years; a recent pay slip; the major assets and liabilities of both you and your spouse; budget worksheets; insurance policies; credit-card statements; wills; and any credit or mortgage applications. Unless you create a separation agreement, your divorce lawyer will use this as a starting point for the discovery process. Your lawyer needs as much specific information about the marriage as possible in order to work out the financial and children’s issues fairly. Most of discovery involves financial matters, for which your lawyer needs specific, accurate details. From the value of items you bought during the marriage to stocks, pensions, and revenue from a business, you and your divorce professionals (e.g., lawyers, mediators, financial advisors, appraisers, etc.) may have to retrieve documentation of every dollar value – including that of premarital assets. There are two general types of divorce: contested and uncontested. In a contested divorce, a judge will decide the outcome if you can’t come to an agreement on your own. In an uncontested divorce, both of you agree on how to divide your assets and debts, who gets custody and pays child support, and whether one spouse needs to pay spousal support to the other. Obviously, an uncontested divorce will be faster and simpler than a contested one. However, the more issues you’re able to resolve on your own means fewer to resolve in court – which will help to reduce your expenditures of both time and money in a contested divorce. If you need to readjust certain arrangements during the divorce process – such as custody, visitation, or support – you can initiate this by filing a motion with the court. A short hearing takes place in which the lawyers representing you and your spouse present their cases before the judge. In most cases, only the lawyers are permitted to speak. However, if you are going the Do-It-Yourself (aka Pro Se) route, you’ll be able to represent yourself in this hearing. Once the judge makes a decision on the matter, the regular process continues as before. 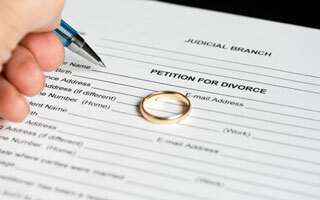 You and your spouse must decide how to resolve your divorce. Will you fight it out through adversarial litigation, or can you set aside personal feelings long enough to negotiate outside of court? Alternative Dispute Resolution (ADR) methods – such as arbitration, mediation, and Collaborative Divorce – have become popular means of resolving divorce-related issues in a cooperative environment. Some states and provinces have made mediation compulsory in the divorce process. If you and your spouse can’t reach an agreement, then your case goes to trial. Divorce trials can take many months or even years, and they’re never pleasant. Generally, you and your spouse each tell your respective side of the story in court. You take the stand, and your divorce lawyer asks you questions that prompt you to explain your side (“Direct Examination”), then your spouse’s divorce lawyer has the option of asking questions or challenging the validity of your testimony (“Cross Examination”). This process is repeated for your spouse. Finally, the judge or the jurors – who only know you through what they have heard in court – weigh all the evidence and make all the final decisions about your divorce. Money and property. Your property will be classified as either “marital” or “separate”. All marital property will go into the marital pot that will be divided between the two spouses, and separate property stays out of the pot. The rules are complicated, but generally speaking, separate property is anything that was brought into the marriage, inherited during the marriage, or gifted during the marriage – and kept in one spouse’s separate name. The goal of property division is “equitable distribution” – meaning a fair division of assets and debts. The more financially complicated your divorce, the longer this will take. You’ll likely need an accountant, a Certified Divorce Financial Analyst® (CDFA™), and perhaps a business or pension valuator to help you make sense of all the assets. Spousal support. In family law, marriage is seen as a financial partnership. When that partnership breaks down, the partner with more income or assets may have to pay support to the other. Sometimes also known as “alimony” or “maintenance”, spousal support is based upon one spouse’s need and the other person’s ability to pay. For instance, you may “need” $5,000/month to cover your expenses, but if your ex is making minimum wage (and is not independently wealthy), then you’re unlikely to get that $5,000/month. Spousal support is intended to cover living expenses while the financially-disadvantaged ex-spouse goes back to work or school to retrain for a higher-paying job. In the case of some long-term marriages, support may be ordered so that an ex-spouse can maintain his/her pre-divorce lifestyle indefinitely. Ask your lawyer whether you’re eligible for or likely to have to pay spousal support. Child support. All parents are obligated to support their children. In a divorce, the non-custodial parent is usually ordered to pay child support to the custodial parent; the custodial parent is expected to use these funds to pay for the child’s expenses. “Custodial parent” means the one that the children live with most or all of the time; the “non-custodial” parent would have visitation or access rights. The amount of child support is based on a number of different factors, including the annual income of each parent, the total number of children in the family, and the custody arrangements for the children. Child custody and visitation. Child custody has two components: legal and physical. Generally speaking, sole legal custody means that one parent has the legal authority to make all major decisions involving his/her children, while joint or shared legal custody means that both parents have an equal say in all major decisions about their children’s lives. Physical custody can be sole, split, or joint/shared (the terminology varies by jurisdiction, so make sure to become familiar with the correct terms for your area). One of the most important decisions you’ll make during your divorce is where and with whom the children will live. Unless your spouse is abusive, both of you should work together to create an agreement in which you both get a fair share in raising your children. Custody battles in court are usually full of character slurs and accusations that are emotionally traumatic for you – and even more so for your children. There is usually a set minimum waiting period between the divorce petition and the final decree. Even if your process is very quick, the waiting period must elapse before the judge officially grants the divorce. Lengths vary between states and provinces, but the average waiting period is about six to twelve months. After all the issues have been decided (either by you and your spouse or by a judge), a court clerk reviews all the papers and sends them to the judge. When the judge signs a document that officially ends the marriage (a Divorce Judgment Order or a Divorce Decree), you are legally divorced. The divorce process is complicated, and this summary doesn’t touch on what an emotional rollercoaster ride a divorce is. Divorce is never easy – and if your ex is uncooperative or downright adversarial, it can turn into a long, painful, and expensive process. It can also damage your children’s psychological growth if you and your spouse don’t consider their well-being and act in a way that will lead to a respectful co-parenting relationship post-divorce. But once it’s finalized, you’re free to start over – so the sooner you reach the end, the better for all involved. Consult the necessary divorce professionals (family lawyers, divorce mediators, CDFA professionals, accountants, therapists, etc.) to find out how to reduce time, money, and emotional costs during your divorce process. I wrote about my divorce experience and also about the immediate aftermath. I wrote it so people felt connected to someone else going through it but also for the people who have no idea what the process is like.